Gaze down the street of homes in the Village Walk community and you’ll see more than two dozen houses with synthetic shake roofing from DaVinci Roofscapes. 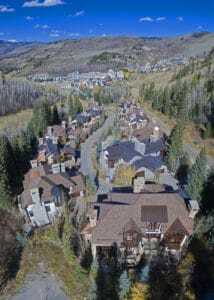 Located on Beaver Creek Mountain in Colorado, the spacious four- and five-bedroom duplex homes have direct access to the Dally ski run. The luxurious ski-in/ski-out homes are just a short walk or ride to the village. Unfortunately the magnificent homes had a big problem. Built 11 years ago with real cedar shake roofs, the Village Walk homes were experiencing leaking from the deteriorating natural cedar. Homeowners of the multi-million dollar properties followed the lead of their association and reroofed their homes with DaVinci Multi-Width Shake tiles in either an Autumn or Mountain Blend. Known for its durability, the DaVinci products can easily stand up to the cold and snowy Colorado conditions. The management team for Village Walk selected Umbrella Roofing to install the new synthetic shake roofs in 2017. Because the task of re-roofing 26 homes needed to take place during the non-snow season, the push was on for the roofing team. And according to Beardsley, the crew was up to the challenge. Now complete, the roofs on the homes in the storybook setting of Village Walk will retain their beauty for decades to come — in any type of weather. The state-of-the-art synthetic shake tiles are crafted with the greatest degree of color control and consistency in the manufacturing process. 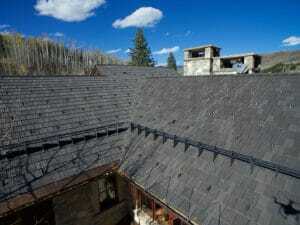 The result is an enduring roof that performs beautifully in any climate. Because homeowners in Village Walk would prefer to be on the slopes rather than maintaining their roofs, DaVinci synthetic shakes are the perfect solution. These durable roofing tiles live up to the look of nature, but do so without the ongoing hassles of maintenance, repairs and replacements. Resistant to fading, rotting, cracking and pests (plus high winds, hail and fire), the Multi-Width Shakes on the Village Walk homes complement the true beauty of their natural Colorado setting.